The three Baltic States of Estonia, Latvia and Lithuania were once part of the former Soviet Union, gaining independence in 1991 and joining the E.U. in 2004. In January 2014 Latvia adopted the Euro as their currency. Riga is the capital of Latvia and is located almost in the centre of the country near to the Daugava River, which flows into the Gulf of Riga. It is an important port and industrial city with an attractive city centre in Hanseatic style. Horse-drawn trams began operating in Riga in 1882 and the system was electrified in 1901. Trolleybuses began operating in 1947 and they are interconnected with the tram system. Today the trolleybus network is one and a half times larger than the tram network and is extensively used. Our filming took place in May 2017 and shows the current tram fleet, which consists of a good number of Tatra T3SU trams now modernised as Tatra T3A trams, some modernised Tatra T6B5 trams now T3M trams as well as modernised Tatra T6B5SU trams converted to T3MR vehicles. The latest trams are low-floor three-section Skoda 15T ForCity trams and four-section Skoda 15T1 ForCity trams. Older trams still use a trolley pole, and all are painted in a smart white and dark blue livery, whereas a number of the low-floor trams are adorned with overall advertisements. The trolleybus fleet at the time of filming consisted of 150 Skoda/Irisbus Citelis 24Tr trolleybuses of which 112 can operate with an auxiliary motor for routes 9 and 27 that travel over the Daugava Bridge without the use of wires. There is also a large fleet of Solaris Trollino 18 trolleybuses. The trolleybuses also carry the same dark blue and white livery as the trams. Both trams and trolleybuses are operated by ‘Rigas satiksme’ and proudly carry the city’s coat of arms on their front panels. Our filming begins in the city centre near to the railway and coach station where we see both the trams and trolleybuses in action. Locations include Sateklas iela, Gogoļa iela, Prāgas iela, Centrāltirgus, Maskavas iela, 13. janvāra iela, Aspazijas bulvāris and Krišjāņa Barona iela. In order to give you a good view of the city we take a number of tram and trolleybus rides and film at each location. 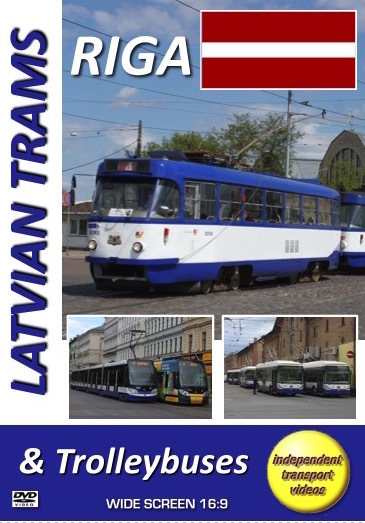 Rides include trolleybus 19563 on route 13 to Bikernieku iela, tram 58066 on line 6 to Brivibas iela where we see tram depot number 5. Tram 58022 on line 6 takes us back to the city centre. We witness a trolleybus changing from its auxiliary motor to wires at Uzvaras bulbaris. Then a ride on tram 30743+30754 to the line 5 terminus at Iļģuciems. A return ride on line 5 onboard tram 30569+30591 takes us to Martiņa iela. Further tram rides are taken on line 7 on different Tatra T3MR trams and we also get a brief look at tram depot number 4. Our filming concludes at Gaiziņa iela, the small trolleybus station in the city centre. This programme concludes with some photographs taken by Steve Kelly in Riga during visits he made in 2004, 2007 & 2008. We hope that you enjoy your visit with us!